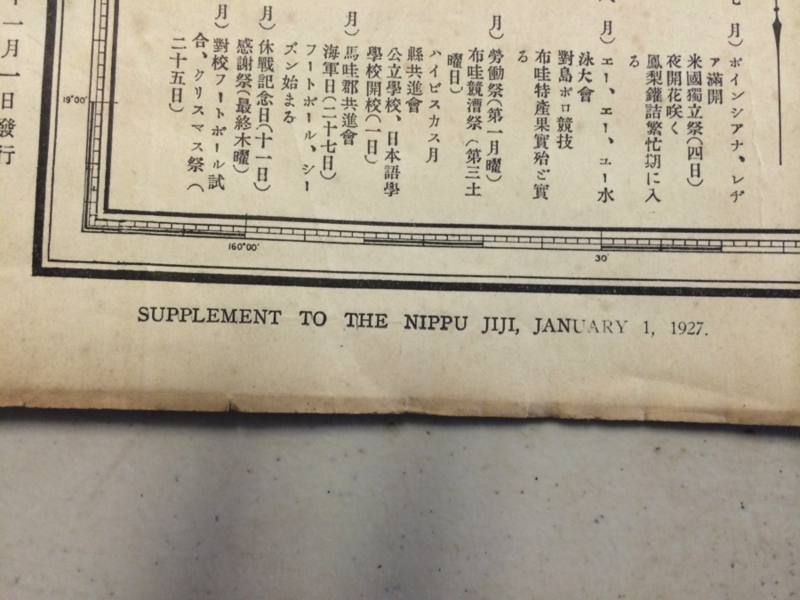 This rare Japanese Language newspaper was published in Hawaii to commemorate the printing of the 9,000th edition. During the late 20’s the Japanese population in Hawaii was quite large and growing. Newspapers such as these were vital to providing information about Hawaii to local and foreign Japanese. The map provides vital stastitics on population, bank savings rates, resources, shipping lines, import, exports, geography, schools, land area and length of shoreline of each island. Eventually, The Greater East Asia Co-Prosperity Sphere plan would include Hawaii with the possibility of re-establishing the defunct Kingdom of Hawaii. Those favoring annexation of Hawaii (on the model of Karafuto) intended to use the local Japanese community, which had constituted 43% (c. 160,000) of Hawaii's population in the 1920s, as a leverage. It was believed that local Japanese were spies for Japan and provided statisical and strategic information to Japan. A full professional translation of this map is available upon request.